Are you a redhead? Or do you know a redhead? We don’t know why but the color green looks particularly smashing on redheads. 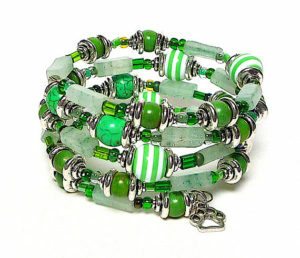 And this bracelet called “Green Thing” with its dangling paw charm will look gorgeous on every wrist. For the month of June, Beading Divas bracelet sales benefit Cat Ranch Rescue in Graham County, North Carolina. According to their website, CRR is a “puddy tat’s paradise.” A 501c3 non-profit, no kill, cage free, lifetime care cat sanctuary; providing a safe haven and medical care to un-adoptable, abandoned, abused and special needs cats. All bracelets are handcrafted, one-of-a-kind, and made with donated beads. Bracelets cost $20, no tax. Cat Ranch Rescue receives $18 for every bracelet sold online. Postage is based on destination. From the Feedback File: “BEAUTIFUL BRACELET! Even more gorgeous in person. Great quality and arrived in perfect condition. Thank you for donating your time and talents to save the fur babies!” ~ Amy L.